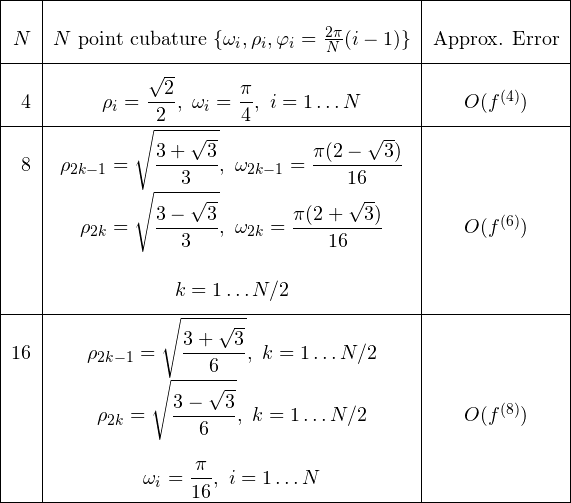 This page is about cubature formulae for numerical integration over the unit disk. In the first part we try to derive coefficients by direct approach, second is devoted to Gauss rules for 2D unit disk based on product of two 1D quadratures. We offer C/C++ open source library which allows user to estimate integral over disk with center at where can be arbitrary. Algorithm is based on Gauss product rules and includes high-precision coefficients. where are such that is exact on polynomials . Formulas of such type are called cubatures of algebraic degree . This gives us approximation error conveniently expressed through function derivatives. To unsure exactness on polynomials up to total degree of we have to find such that multipliers of all partial derivatives in are equal to zero. This leads to the system of nonlinear equations, which can be solved analytically for small and numerically for the higher degrees. Additionally we set and to be symmetric, since such choice makes cubature exact on naturally, where at least one of or is odd. Below we show several cubature formulas derived by the explained procedure. Please leave comment on this page if you find these formulas useful. Derivation of optimal cubatures with minimal function evaluations required to achieve given algebraic degree is not an easy task, they are known only for some (see ,). However if we want to build cubatures for any desired approximation order we can use product of two 1D rules to estimate . Although this approach is not optimal in the sense of number of integrand evaluations it gives flexible and easy way of cubature derivation (see ,, for details) which we repeat here. 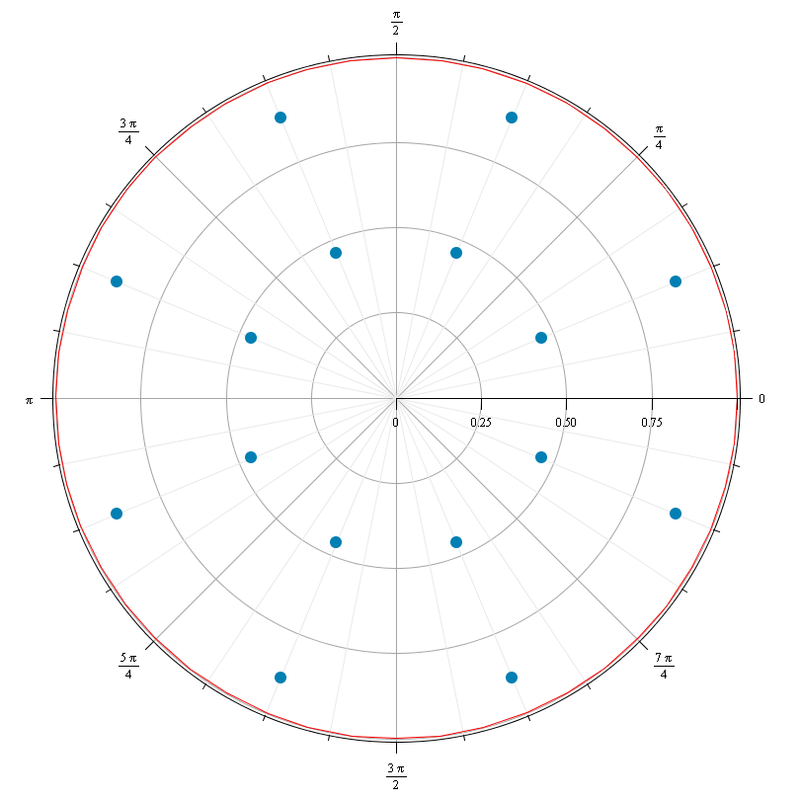 These integrals can be computed separately from each other by using 1D Gauss quadratures. It is a symmetric tridiagonal matrix. Implicit QL algorithm can be applied to solve this task efficiently (sterf, stein routines in LAPACK). Then points are calculated eigenvalues. Weights where is the first component of corresponding eigenvector). In our case , and can be calculated by analytical formula for any (send me e-mail if you are interested). 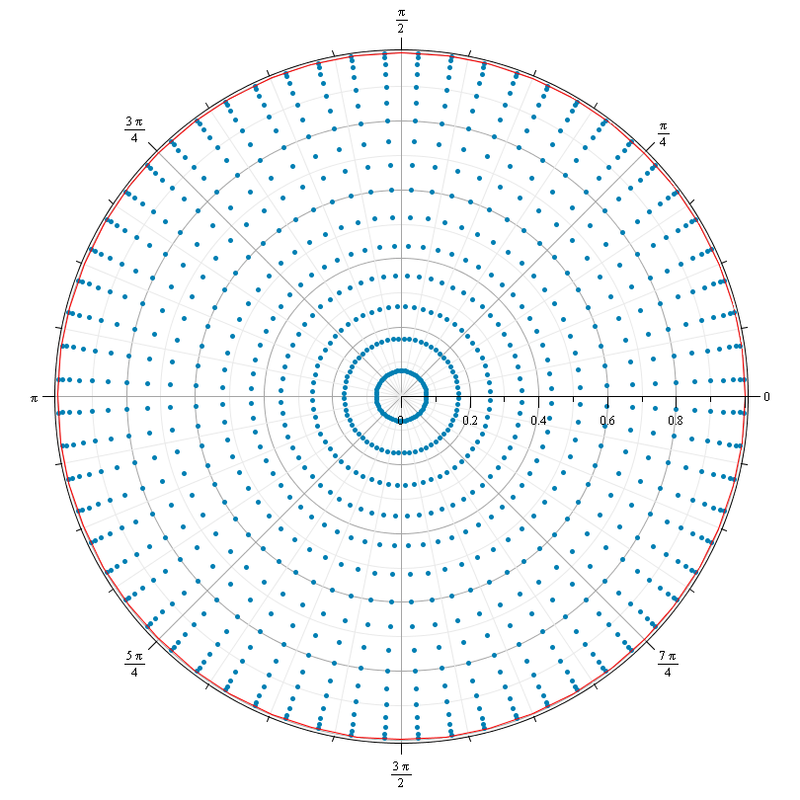 It uses high-precision points and coefficients of 1D rules and to approximate integral over 2D sphere with center at . I have used Maple for all symbolic calculations and QuickLaTeX for rendering mathematical equations on the web page. Unfortunately Maple was too slow and unstable for derivation of 1D -quadrature with . I ended up writing my own C++ program specifically for that using ALGLIB and multi-precision arithmetic library MPFR. Let me know if your interested in this program. The most complete and recent compendium of cubature formulas is Encyclopaedia of Cubature Formulas maintained by Ronald Cools . He wrote several surveys on cubature formulas, some of them are available online, check his publication page. In particular his survey on cubatures for unit disk is available here A survey of known and new cubature formulas for the unit disk. Although it doesn’t contain numeric values for weights and points (exept for ) it has huge number of useful links to other topic-specific papers. A.H. Stroud, Approximate calculation of multiple integrals, 1971. R. Cools, K.J. Kim, A survey of known and new cubature formulas for the unit disk. A.H. Stroud, D. Secrest, Gaussian Quadrature Formulas, 1966. G.H. Golub, J.H. Welsch, Calculation of Gauss quadrature rules, Math. Соmр. 23 1969. W. Gautschi, Orthogonal Polynomials: Computation and Approximation, 2004. I.P. Mysovskikh. Interpolatory cubature formulas. Moskva: “Nauka”. 1981. (Russian). I downloaded Gauss_2D_Sphere_Cubature.zip and try to run example.c but got an error message that gauss_product_2D_sphere is not found. 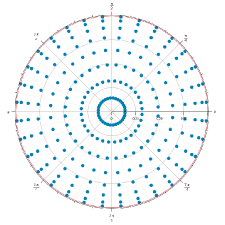 Could you please let me know if gauss_product_2D_sphere is missing in the distribution and if it is send set to me. You have to compile & link gauss_2d_sphere.c along with example.c. Thanks for making this available. When running the example, I notice that the error in the integral starts to increase for n > 50 (10^-13 as opposed to 10^-15). I don’t need that level of precision, but was curious if this is something particular to the function used in the example or a generic effect. Also, one rule in particular stands out: “n = 384: error = 2.44418289875682”. Maybe one of the coefficients for this rule is incorrect? 1-50, 64, 128, 192, 256, 320, 448, 512, 576, 640, 704, 768, 832, 896, 960, 1024, 2048. No 384 is supported – sorry for not making clear this on the page. 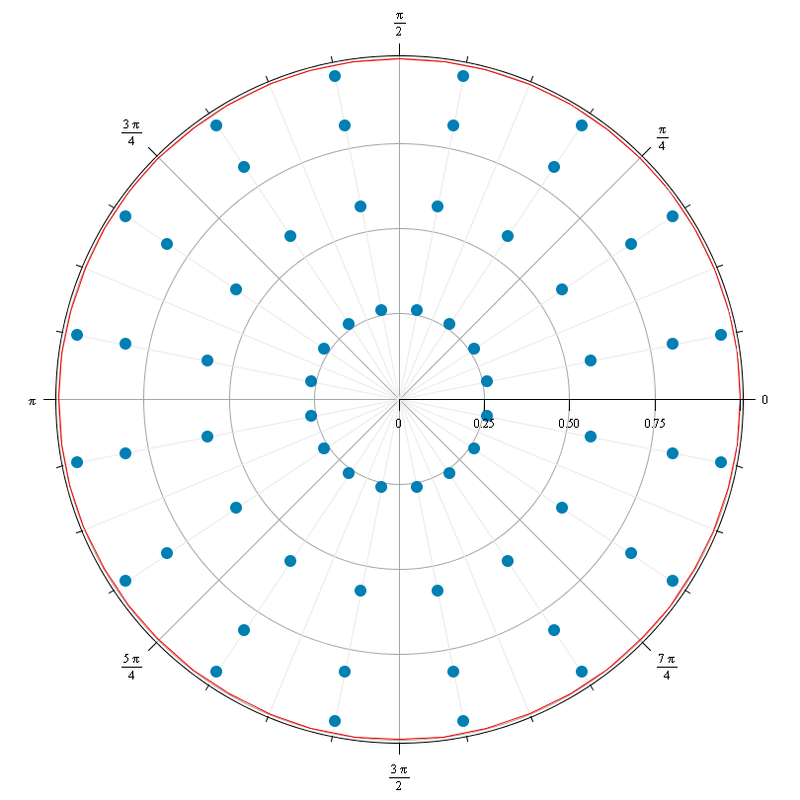 I am trying to develop gauss like formulas for cubature over the unit disc with the constraint that all the points need to be located on three straight lines, all three lines intersecting on the boundary; in one point (say x=0, y=-1). This leaves entire areas not covered but what can be done? Interesting case. You can build 2D interpolating polynomial over the points you have and then derive cubature formula by integrating this polynomial. Take a closer look to “Direct derivation” section on the page – it briefly describes this idea (using power series instead of polynomial). Let me know about your further progress on the task – it is very interesting for me. By the way, are there any restrictions on number of points? Location of lines is fixed or can be chosen? Location of points on the lines is fixed (uniform sampling) or can be chosen? Let me know if you need my further help. In your example for an 8 point cubature the radius of 4 of the points is sqrt((3+sqrt3)/3). 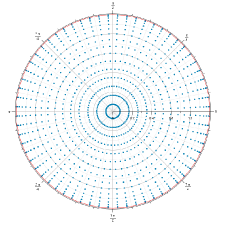 This is obviously greater than 1.0 and outside the unit circle. It is perfectly normal for cubature to have nodes outside unit disk. Check out paper by R. Cools (second reference in the list). Many thanks for freely providing the information on this webpage. I would like to use this cubature in my meshfree code and would like to confirm the points and weights. Are the cubature points given by x = r[j]*q[i] and y = r[j]*t[i] as shown in the example C++ code? With that said are the weights given by A*B? I am also interested in the C++ program using ALGIB mentioned above. what’s the best numerical approach known in literature? Great resource! Question: Do you know where I could find Kronrod-type extensions for these formulae? Cools lists a couple of rules in his survey, but they all have fatal flaws, like negative weights, nodes outside the unit disk or on the boundary. 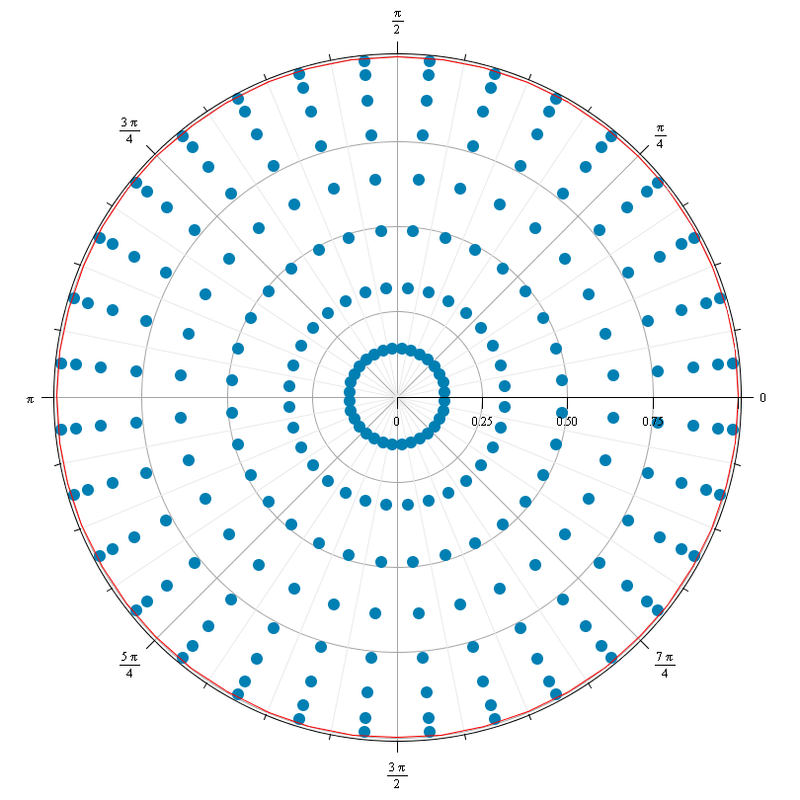 Do Kronrod style extensions with positive weights and interior nodes exist?